Visual Studio is Dead? « Life…as it Relates to Technology. « Yahoo Finance Pushing Facebook Links? That pricetag virtually assures us that all new innovation WILL NOT take place using Microsoft tools. Further, it won’t run on IIS which means it will won’t run on Windows (as both, while not technically necessary for .NET development, are intimately intertwined from a real world perspective). I deal with many small businesses and deal with them intimately. I don’t know how many times I’ve heard, “I don’t want to be tied into Microsoft stuff,” or “Microsoft stuff is too expensive for us.” Take a look at any hosting provider. The linux options are universally cheaper – all the way from the cheapest shared hosting to dedicated servers, Microsoft is more expensive to run. The tools all cost money. 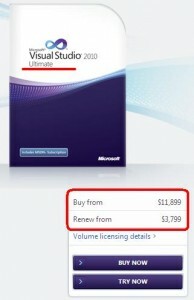 SQL Server is expensive to license (not as bad as Oracle, but that is a different topic). Microsoft support is expensive. The end result is that Microsoft is firmly entrenched in the upper crust of Worldwide business, but has virtually no support from the up and comers or the small business ranks. The only reason any average Joe has Visual Studio running on his machine is because his employer has a subscription to MSDN. Microsoft even makes it a pain for those guys to install it on their home machines now. (But they did it a really long time ago.) And Microsoft has never figured out how to adapt. Microsoft needs desperately to gain some traction. Visual Studio is still AWESOME. You can build a killer website in a fraction of the time it takes with PHP. It’s time to give it away for free and get a couple Zuckerbifs on board before everyone catches up (and it won’t be long).